and was last updated on March 20, 2009. 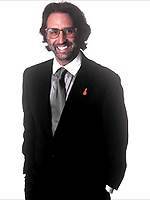 Sad news: Ron Silver died of esophageal cancer on the morning of March 15, 2009. 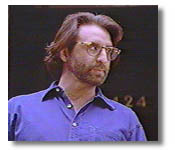 I'll remember Ron Silver for his powerful acting, wide-ranging activism, and intellect. My condolences to his parents, brothers, children and friends. As we all know, he has left an enormous legacy through his acting and social activism. He lives on through this legacy. Thank you for the outpouring of condolences, support and remembrance in the Guestbook. I hope that Ron Silver's friends and family draw some comfort from them. The marquees of Broadway theaters were dimmed on Wednesday, March 18, 2009 for one minute at 8:00pm in tribute to Ron Silver. Several people have sent messages of support and condolence to my email and asked me to forward them to the family. I do not have contact information for his family (nor would press for this from them at such a time), so please use the Guestbook (link at left) to convey your support, as this is more likely to be viewed by them at some point when they are able. My personal memory of Ron Silver: In the summer of 1997, I was looking to set up a webpage just for fun (my others were quite serious), and found that my favorite actor, Ron Silver, had no fansite. So I set one up for him. I contacted him at Actors Equity, where he was president at the time, informing him of the website as a courtesy and seeking any feedback. He replied, was quite supportive, and gave me a couple of minor edits for the site. I was privileged to meet him years later at the Hollywood premiere of "Festival in Cannes," and he could not have been warmer or friendlier. He took me by the arm and introduced me round to others at the post-viewing reception, and we chatted for a while. It was one of the more memorable evenings of my life! A fansite maker could not have asked for a finer subject, nor a more gracious one. Among the reasons I set up this site: I feel that Ron Silver was a celebrity who was mindful of the social power that came with his career, and I believe he used that power conscientiously. Over the years I received many messages from visitors to this site regarding Ron Silver's political stances and his media appearances. I was surprised at occasional notes in the past (pre-9/11) from people accusing him of being a knee-jerk liberal, as he always projected a much more thoughtful range of political beliefs in public. After 9/11 he was perceived by some, negatively, as a conservative spokesperson for his political views. I don't think he was rigidly left or right, nor simplistic in his political views. He displayed independence and intelligence in his many media appearances. I did not always agree with his opinions, particularly about the Bush administration, but I respected his right to express them, as well as the critical thinking that he brought to any topic he addressed. A reluctant rant: Some of the memorial messages I've seen (both here and elsewhere) undercut the classy attitude he brought to discussions and debates with people he disagreed with. Whether it's triumphal right-wing crowing about how he was a "left-wing loon" who "came to his senses" or left-wing teeth-gnashing about his becoming a right-wing "loon", is it necessary? Does it shed light on anything? Honor his memory? Or just make you look like an ungracious blowhard? Ron Silver was able to engage with people from across the political spectrum, both before and after he publicly supported the Bush administration after 9/11. I hope that more people will try to emulate him. Welcome, and feel free to sign the Guestbook (link at left). The only editing I do in guestbook postings is to eliminate ones that are nothing more than ad hominem and/or obscene rants, and certainly any that are anti-semitic - otherwise, all viewpoints (even those of ungracious blowhards) are welcome. FYI, messages sent directly to me will not be forwarded to anyone. Ron Silver was one of the bloggers featured at Pajamas Media. Check it out here. Also, he was featured on indie_talk, Channel 110 on Sirius Satellite Radio Monday-Friday 9-11am ET. 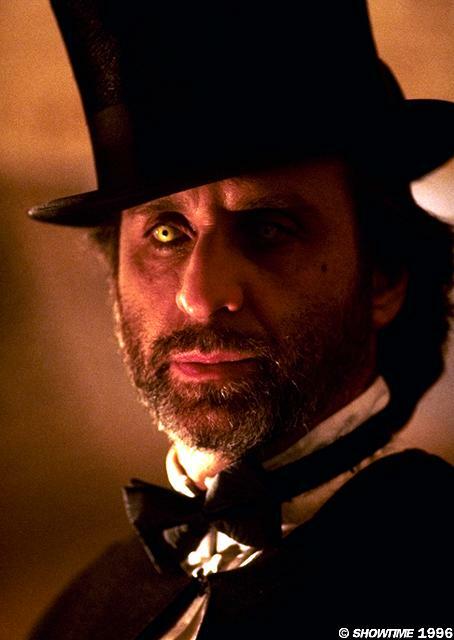 Ron Silver was born on July 2, 1946. He grew up on Manhattan's Lower East Side, and attended Stuyvesant High School. After graduating from the University of Buffalo with a degree in Spanish and Chinese, he received his master's degree in Chinese History from St. John's University and the College of Chinese Culture in Taiwan. Before turning to acting, he flirted with doing intelligence work. He took acting lessons while working on his masters degree. Silver trained for the stage at the Herbert Berghof Studio. He also studied with Uta Hagen and at the Actors Studio with Lee Strasberg. His first big break came as a cast member of the hit satirical stage show "El Grande De Coca-Cola" in 1973; after that he moved to California and got a part on the TV sitcom "Rhoda" (see photo from "Rhoda" (52K)). From then on Silver remained steadily employed in TV and theater; his screen career was renewed in the early '80s, and by the late '80s he was landing lead roles in major productions. Silver was known as an intense, electrifying stage and film actor; for his performance in David Mamet's Broadway play Speed-The-Plow he won the Tony and Drama Desk awards. He also appeared on Broadway in "Hurlyburly" and "Social Security." In addition, he starred in two one-man shows, "And..." and "Bill Graham Presents." A dedicated political activist, Silver was a vocal supporter of environmental and anti-nuclear organizations. In 1988, he founded The Creative Coalition, a political action group calling for the involvement of artists in pressing social issues, and served on their Advisory Board [see photo of Creative Coalition members at a rally in Washington DC (77.5K). I've seen Silver in most of the films and television programs in which he appeared. My favorites are in (1) Enemies: A Love Story, (2) Reversal of Fortune, and (3) "Wiseguy." He played a lot of easy-to-hate villains during his career, but I think he was great as the son trying to grant his mother her dying wish in "Garbo Talks," and as a man caught between the needs of his daughter and new wife in "Married to It." I thought he was hilarious as Larry Weisman in "Best Friends." As Valentine in The Shadow Zone (left, 1996), and as David Sternberg (with Jerry Lewis) in Wiseguy (middle, 1988). 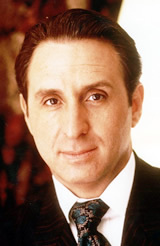 Ron Silver had continuing roles on several television series over the years, including "Rhoda," "Hill Street Blues," "Chicago Hope," "Veronica's Closet," "The West Wing," and "Skin." 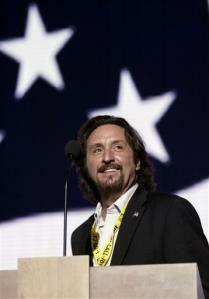 September 1, 2004 New York Times article about Ron Silver's appearance at the Republican National Convention. Here is a set of articles about and editorials written or co-written by Ron Silver, and a transcript from CNN's Talkback Live February 20, 1998 broadcast, which he hosted. These are listed (and linked) below. I will try to add more current ones to them as I am able. • 1995 Atlanta Journal & Constitution article about his life and his role as Henry Kissinger in "Kissinger and Nixon,"
2. My other web pages are all Very Serious, and I wanted to have just one that was Fun. 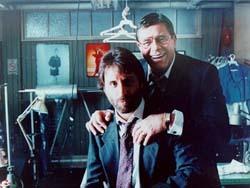 I developed and maintain this website as an individual admirer of Ron Silver's work - it is not an official fan site. Although I collected the information in this site from the internet and other sources, I bear responsibility for any inaccuracies in this page. If you find any or know of any information that is more current, please inform me and I will correct it. Stop by my home page to find out more about who I am.